If there is one thing this girl loves it is a floor steamer. Today I am sharing my thoughts on the new Bissell Symphony that not only steams your floors, but also vacuums them at the same time! 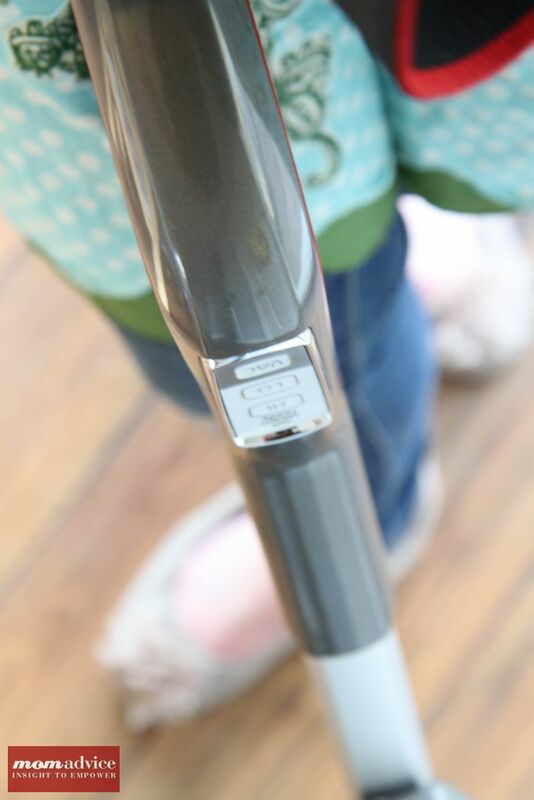 In conjunction with my partnership with Walmart, Bissell sent me the Bissell Symphony Vacuum & Steam Mop to share my honest feedback about their product. I am no stranger to floor steamers and have reviewed quite a few of Bissell’s products including the Bissell Steam & Sweep & the Shark Vac 2-in-1 Vac Then Steam. Having reviewed many different versions of the steam and sweep concept, I was excited to see how this one measured up compared to the other models. I tested this model on three different floor types in our home including our laminate wood flooring, tile, and linoleum. The information provided in this review applies to all these types of flooring. As I always do when sharing about products, I will offer the pros and cons to this model! Simple & Easy to Use Set Up- This vacuum comes together in no time flat and really only required inserting one piece into another, meaning we were ready to start steaming within five minutes of opening the box. 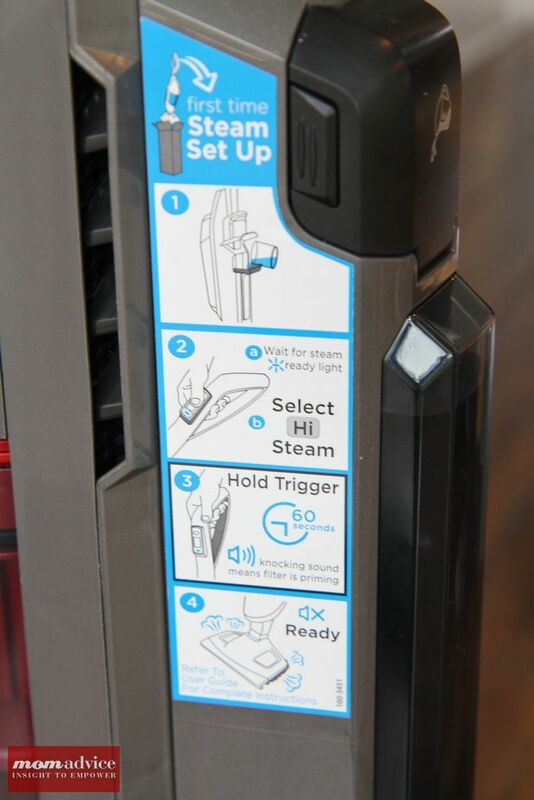 The labeling on package, added “first timer” stickers on the side, and the booklet within clearly outlined how to use this model. There was no troubleshooting with set-up or how to use this steamer. Height Adjustment- It’s no secret, I am a little woman. While many handles on sweepers are too long for me, the Symphony offers an easy to use height adjustment feature so that I am not handling the vacuum awkwardly like I have to do on past models. 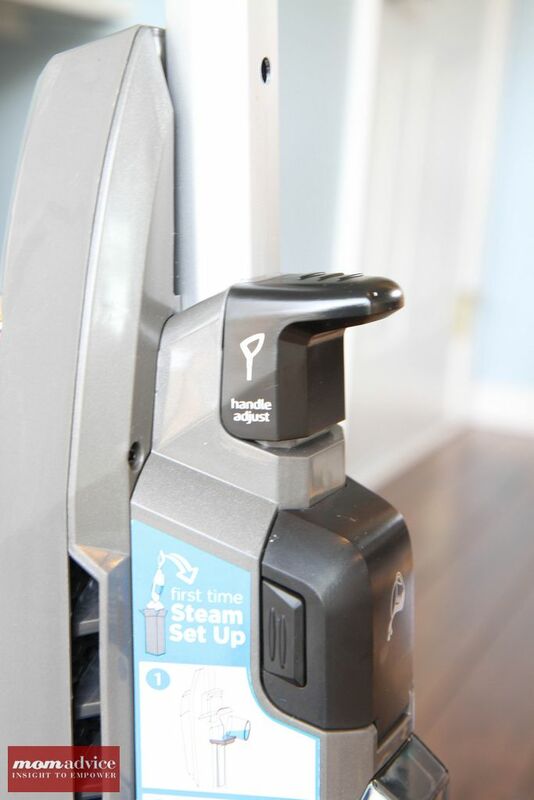 Quick & Smart Steam Technology- After plugging in the Bissell Symphony, it only takes 30 seconds before you can start steaming. To begin steaming, just hold down the trigger for 60 seconds and you are ready to go. 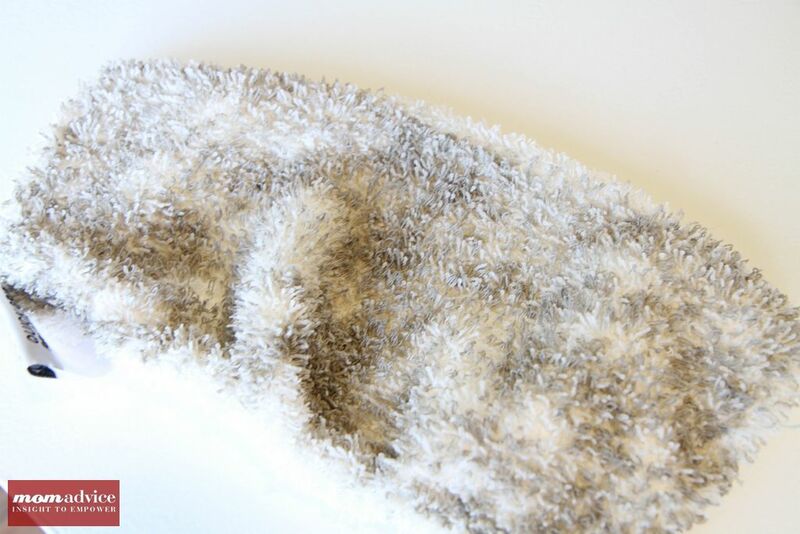 The steaming also leaves a beautiful streak-free finish on both the high and low steam options. If you don’t want to steam and sweep at the same time, you can select one or the other option without needing to commit to both. I don’t know why you would do that though since you are doing the job in one swipe, but the option is there if you want it. REALLY Steam & Sweep at the Same Time- Some units we have tried offering steam and sweep capabilities at the same time, but I think this is the best one that I have used yet. 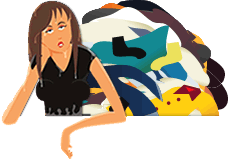 The vacuum is more powerful, easily picking up small debris and crumbs and even tackled the more difficult projects that quick vacs I have used could not touch, like kitty litter, without backfiring the debris. As you are sucking up debris, you can also be steaming at the same time, which makes it easy to do a one-pass job on all of your floors. MUCH Better Design Than Past Models- There were always a couple of design flaws, I felt, with past units including thin or poorly designed pads and an aching finger from holding down a trigger to release the steam. This is truly the best Bissell yet (we have had three different models in our home over the years) because I don’t have a hand cramp from the trigger and the pads are genuinely plush and well-fitting to this model. The trigger on this unit fits into the handle and requires a little light pressure while pushing it around. High & Low Steam Options- Not every mess calls for a lot of steam, so I love that this model offers a high and low steam option that you can select for the job you are going to tackle. The high version is made for those terrible sticky messes my kids create (spilled gallon of juice, anyone?) while the low option is just our everyday craziness that we deal with in our kitchen. I promise I would share if I could find one, but this is the first model that they have created that I absolutely love and have had no issues with. It’s lightweight, picks up like a dream, steams beautifully, and performs well. I usually donate these vacuums to others after we review it, but this one…this one earned its rights to be a workhorse in our home. The proof is in the pad. 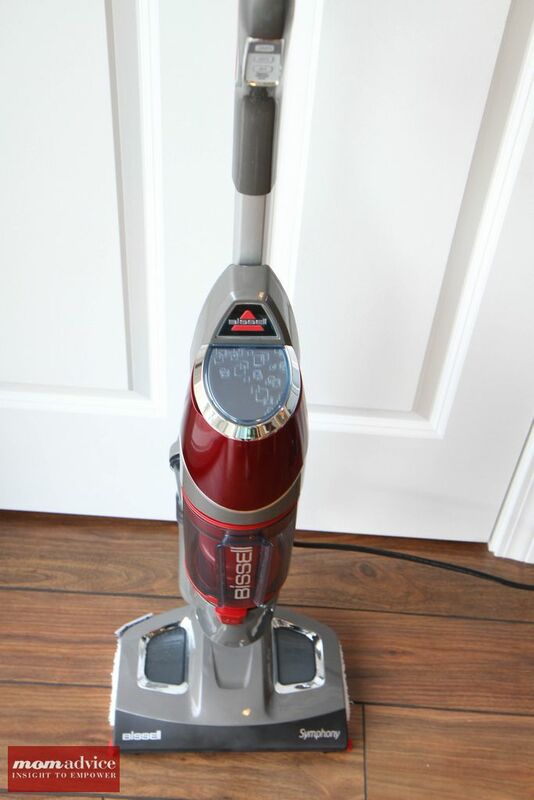 Thanks to Bisell & Walmart for giving me the chance to review yet another vacuum. You can find a few other Bissell reviews here like the BISSELL Versus Cordless Vac, BISSELL Steam & Sweep Hard Floor Cleaner, and BISSELL DeepClean Premier Carpet Cleaner for a couple of other great examples of two more of my favorite BISSELL products. I just tried the Bissell Symphony and have mixed feelings about it. I found it a little frustrating at set up to get the plastic-y parts to act as such as in the instructions. Great thinking behind it. but was disappointed with the streaks on my floors. It left a cloudy haze. I was hoping to have shiny, streak free hard wood floors. I accidentally let if up right for a few minutes and got a white burn mark on my hard wood floor. I’m worried it will scratch the floors, as it took much effort to push across the floor. It did not glide, felt like a lot of effort to push it, like something not quite right. The ‘trigger’ is weird, I couldn’t find it at first, only a purple piece of plastic that does not feel like it’s ‘triggering’ when you press it… wondered if it was broken. The vacuum aspect is great. love that you can mop & vac at the same time, and the vacuum works very good. I may return as it was very expensive, and does not seem worth it’s price, all things considered. I moved in an apartment with this mat laminate and it is so hard to clean this thing! I have the feeling that the dust can’t be removed at all. I definitely need a steam cleaner. Thank you a lot for this article! I will buy one of these things for sure! i saw the symphony by bissell on hsn tv today. i was impressed and i want to get one. i went online and i read different reviews from different websites about this symphony by bissell. the main complaint from many different people was that the steam part just stopped a short time after purchasing it;. say within 2-3 months. some of these complaints might be by people ignoring the hard water information? i also noticed that some of the people complaining were complaining about a blue bissell combo. hsn was using a red one with gray. the exact one you show on your review which i also am impressed by. read. Vacuum ok but not exceptional. If you do floors every 3-4 days, should be fine. I only do it about every 2 weeks. Vacuum leaves stuff behind, steam mop does not clean up “old” spots. I AM A MECHANIC, AN APPLIANCE REPAIR(WO)MAN AND BUSINESS OWNER. AFTER WATCHING A LATE NITE INFO-MERCIAL ON THE BISSELL SYMPHONY, I THOUGHT I’D TRY IT. THAT WAS 2 YEARS AGO. IT’S BEEN USED DAILY IN MY HOME, WITH KIDS AND DOGS WITHOUT A PROBLEM. AS A MECHANIC, I’M AMAZED. AS A MOTHER, GRANDMOTHER, AND A NOT-SO-CLEAN FREAK, TOTALLY GRATEFUL TO THE MASTERMINDS THAT CREATED THIS WONDER MACHINE. IF YOU DON’T HAVE A CARPETTED HOME, YOU ARE AN IDIOT IF YOU DON’T BUY THIS. IF I COULD, I’D CREATE MY OWN STORE, BUY ALL OF THEM, AND RESELL THEM AT AN ASTRONOMICAL PRICE. WHY???????? BECAUSE IT’S THAT GOOD. THE ONLY CHANGE I WOULD MAKE IS A WIDER HEAD TO CLEAN LARGE ROOMS FASTER. HOTELS COULD USE THIS IF THEY COULD DEVELOP INTERCHANGEABLE HEADS SIZED FOR THE ROOM. OMG, EVEN AFTER 2 YEARS YOU COULDN’T PRY THIS OUT OF MY HANDS. SANITIZE,MOP,VACUUM….ALL AT THE SAME TIME? ALMOST BETTER THAN CHOCOLATE….ACTUALLY, IF I HAD TO GIVE UP CHOCOLATE TO KEEP THIS, I WOULD. I put a little vinegar in with the water and now the steam does not work. After, I read the warning to avoid using vinegar. How can I repair my Symphony?